The ultimate for accurate professional use. The satin smooth anodized finish has calibrations that will not clean or rub off. Available in silver or gold, or silver color coded, with a bold color strip in the center, red, green and blue each side. Left to Right reading calibrations that are easier to read than traditional architect scales that have calibrations that reverse through each other. 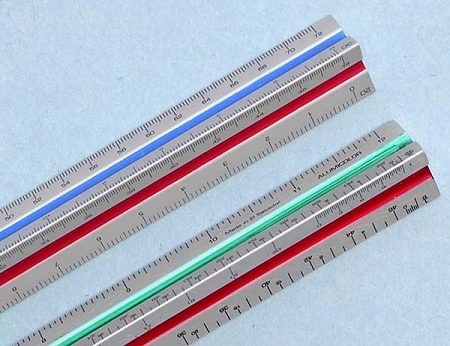 Architect calibrations are: 1/4, 1/8, 1/16 and 1/32.